We are about to Skype with Mr. Jones' class. We will ask the 1st question. We ask: Is the number a multiple of 3? They said yes!They asked "is the number even"we said no." Then we asked if the number is even. They said no. They asked if our number was prime. We said yes. They asked if our number is greater than 50. Yes it is! (And by the way, our number is 97.) We ask them if our number is less than 30. They said no. They asked if we had a 3 in the one place. We say no. We ask if their # has a 9 in it. They say no. They ask if our # has a 9 in the ones digit. we say yes. They ask if there is a 6 in the 10s place. We say no.They ask if our # is 73 We say no. Then they say is your number 97? We say YES!!!!!!!!!! Their # is not 47. Their ones place is higher than 3. Their # is 57!!!!!!!!! That was SO much fun! Bye!!!!!! In the top middle picture, that's us while we're blogging. In the top left picture, Austin and Isaac are talking with Mr.Jones' class through our TodaysMeet. Our goal in this Mystery Number Skype was to guess each other's number by asking questions to figure it out. After asking a question and getting our next clue, we worked in our teams to use that information to narrow the possible numbers down on our number grids. It was our first name and it was very HARD, but we had a lot of FUN!!!!!!!! 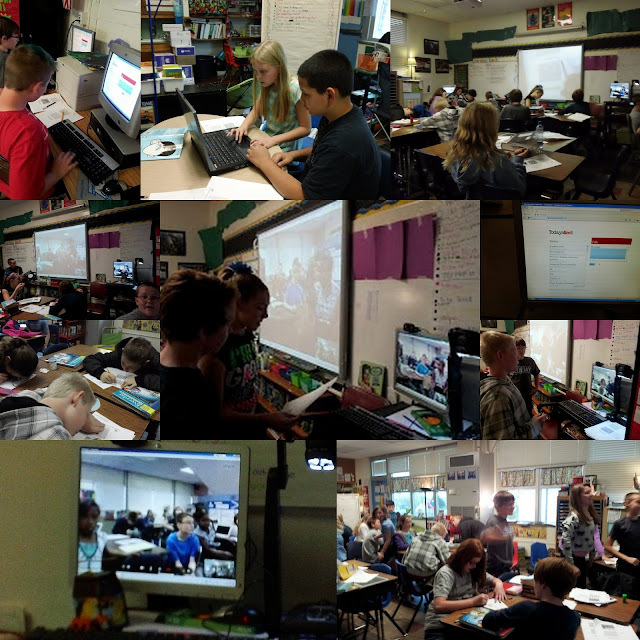 During the Mystery # Skype, we talked with Mr.Jones' class through our Todays Meet. This is a pic of the screen as we were reading what they wrote and typing back to them. CLICK HERE to view the rest of our Today's Meet transcript.